Nobody knows who I am! I keep getting transferred from one department to another! Why don’t they communicate with each other? These often-heard customer complaints are usually the result of "stand-alone" departments, as shown below. But it doesn’t work. 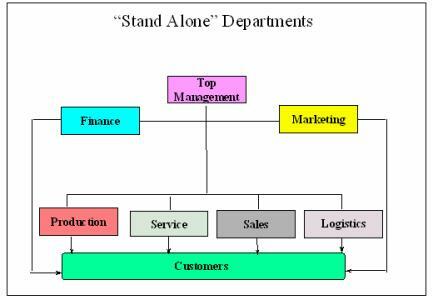 The "stand-alone" departments continue to deal with the customer from their own narrow perspective, leading to customer confusion and anger. Buy this product, suggested sales. And the customer agrees. What? You bought this machine? I could have kept the old one going for another year! cries service. It’ll take three months to make, says production. What order for what machine? asks logistics. We love you! We love you! is the message of the brochure sent by marketing. “Pay or die!” is the message of the letter sent with by accounts with the invoice that arrives in the same batch of mail with marketing’s love letter. The answer to this cluster of problems is simple: Form customer teams. The customer team is a powerful and fundamental CRM concept, especially for small to medium-size enterprises (SMEs). 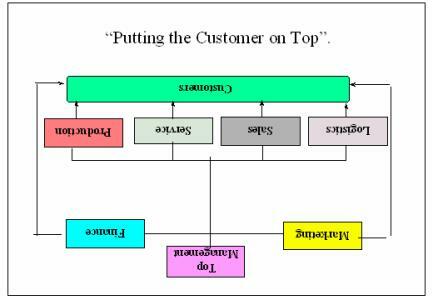 The primary customer team consists of people who have or are responsible for contacts with a specific group of customers, often represented in a customer pyramid. When needed, the customer team can be enriched with representatives from other departments such as finance, R&D, production and logistics. Here is how customer teams can work together to improve customer performance. While the customer may be under the impression that the account manager or field sales person is his or her primary contact person, the customer team agrees among themselves that a de facto customer manager is assigned to the customer depending on the current customer relationship. 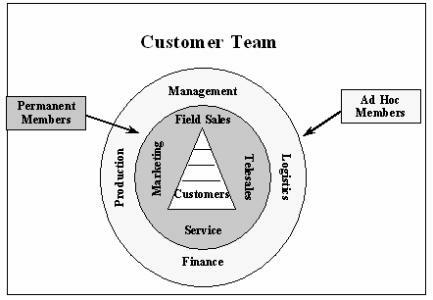 The field sales person is the manager of Customer X, because there is a sales cycle in process for a major order. The telesales person is the manager of Customer Y, who is a steady customer who normally orders by telephone. The service person is the manager of Customer Z, because it has just purchased a large machine and the service staff is on premises installing it. The marketing person is the manager of suspects, which he will, through telemarketing and direct mail, bring to prospect status. The customer manager can change if the customer situation changes. For example, if Customer X gives the order, and the service staff has to install the machine, the service person becomes customer manager. And when a suspect becomes a qualified prospect ready to buy, the field sales person takes over the account. Customer teams do not usually sit and chat in meetings every Monday morning with coffee and doughnuts. While the teams do meet at critical moments for setting customer goals and making account plans, customer teams are quite often "virtual," communicating with each other through email, the telephone or activities registered in the customer database system. Elizabeth, a saleswoman for a company that makes baths for elderly and sick people, has a trial placement of a bath at a customer, a large home for the aged. A trial placement usually means a sale, because the product is of very high quality and the product is already installed on the premises. Elizabeth returns to the customer with her order book in hand, confident of making the sale. But to her dismay, she discovers that, three days earlier, the thermostat on the bath had malfunctioned and several old folks had narrowly escaped getting cooked. The complaint about the thermostat had been reported to service, but Elizabeth didn’t know about it. The result: a lost sale, not because of the technical fault, but because the customer lost faith in the company when Elizabeth showed up unaware of the problem. Had there been a customer team in place, service would have informed her of the problem, and the order would have been automatic. Mr. Customer, we really value your business, so my boss says we should put two people on your account. I am your account manager, and you can call me 24 hours a day, seven days a week if you need me. But I am often on the road. Mary is in the office all day, so for the smaller problems (and the orders! ), you can call her. As a matter of fact, Mary can call you once each week to see how your stock position is and solve any little problems. Is Tuesday the best day for her to call, or is Thursday better? The customer is delighted you are recognizing his importance and apparently doubling your attention to him. Mary can be more efficient by planning her calls to the customer at an agreed day and time. Mary feels "empowered" with her new responsibilities as customer manager. Mike can cut his sales visits from eight to five per year, giving him more time to acquire new customers. Make sense? Try it out for yourself!